Now, here is an interesting scenario for you, a simple mind excercise. Java understands final lil different from constant. Say I create a final array with the following code. On execution, we can see the data of 3rd element is changed. So in what sense is it constant? let us take a look at this. 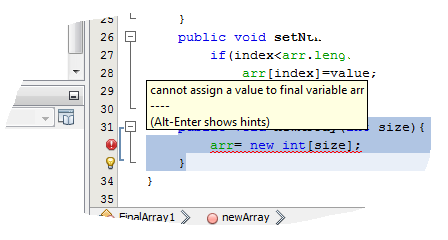 We add newArray(int size) method to FinalArray1 class. we can see an error on compile : "cannot assign a value to final variable arr". arr array reference variable is final and not the array elements. Quite weak isn't it, and the same goes for ordinary objects ─ only the reference is protected from modification not the object referenced. So, is there any point in using final? By making other final we can hope that the compiler will not allocate this local on the stack and generate the assignment but will use the now typechecked reference to obj instead. Why this code does not compile successfully? Can I call main() from another class? K.A.N. Nancy. Picture Window theme. Powered by Blogger.